December 27, 2010  Muslim Americans have fallen under suspicion in the aftermath of the terrorist attacks on September 11. 2010 was no exception. Moustafa Bayoumi, author of How Does It Feel To Be A Problem, talks about the year for Muslim Americans as it draws to a close. December 23, 2010  The traditional representation of Jesus' birth includes a manger surrounded by shepherds, wise men and farm animals. But did it really happen that way? Many theologians acknowledge that the accepted Nativity scene is a result of 2,000 years of interpretation and elaboration. December 22, 2010  For the most part, these are grim days for Catholic nuns. Convents are closing, nuns are aging and there are relatively few new recruits. 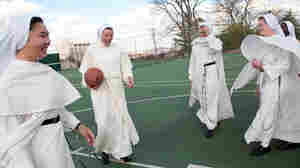 But in Nashville, Tenn., the conservative Dominican Sisters of St. Cecilia are seeing a boom in young recruits. The average age of new entrants is 23. December 22, 2010  Many figures in religious history have been depicted as black, including one of the Three Kings who came to Bethlehem with gifts for baby Jesus. David Bindman and Henry Louis Gates Jr.of The Root have this gallery of images that depict black people before the 18th century. 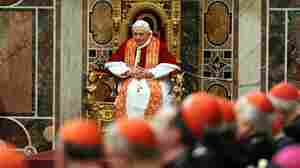 December 21, 2010  The Vatican released a statement Tuesday that sought to clarify published remarks by Pope Benedict XVI that some had seen as a sign of change or softening in the Roman Catholic Church's teaching on contraception. December 20, 2010  On Tuesday, a judge in the East African nation is expected to decide whether a tabloid may continue to publish the names of gay men and lesbians. 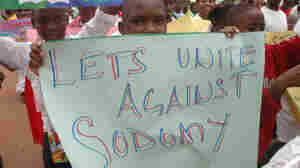 The decision comes as the Ugandan Parliament is considering a bill that would impose the death penalty on gays. December 18, 2010  Saturday is the annual "Boar's Head Gaudy" at Queens College at Oxford University. Every year right before Christmas, the college invites alumni to the dinner, which begins with the pomp and circumstance of bearing a boar's head on a platter. It's a party that goes back about 600 years. Host Scott Simon speaks with Elaine Fantham, professor emerita of classics at Princeton University, about the ancient rituals and traditions that inspire holiday celebrations. 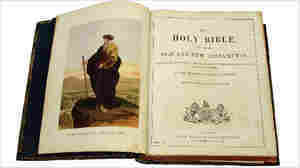 December 17, 2010  What does it take to become a spiritual leader? A new two-part documentary, airing on PBS next week, explores the journeys of seven people from different religious backgrounds, to become leaders within their faiths. Host Michel Martin speaks with Daniel Alpert, director of "The Calling" and Jeneen Robinson, an African Methodist Episcopal Church pastor, who is featured in the film. 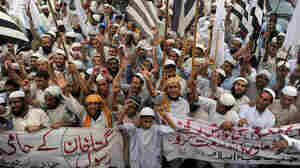 December 14, 2010  The death sentence last month of a Christian wife and mother charged with blasphemy has provoked a sharp debate in Muslim Pakistan over strict laws that protect Islam. Fundamentalists have called for Asia Bibi to be hanged, while international groups have condemned the case against her. December 12, 2010  Last week vandals sawed the limbs off the Glastonbury Holy Thorn Tree in Britain, reducing it to a stump. The tree is thought by some to have ties to the earliest days of Christianity, and each year local children cut sprigs from it to garnish the Queen's Christmas dining table. Host Liane Hansen takes a moment for the sacred tree. December 11, 2010  Holidays are time for traditions, and one of the biggest American holiday traditions is arguing about religion. 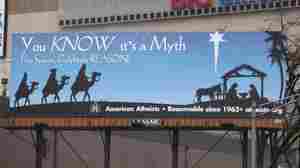 This year, the season's biggest religious controversy is in an unlikely place. December 10, 2010  In Tell Me More's weekly “Faith Matters” segment, host Michel Martin looks at the re-launching of a church organization representing the nine largest traditionally Black denominations. The Conference of National Black Churches has been meeting in Washington, DC, to tackle challenges facing the African American community today. Host Michel Martin speaks with the organization's chairman and Senior Pastor at New York's Grace Church, Reverend W. Franklyn Richardson, about the group's plans for change. December 9, 2010  The possible repeal of the ban on gays serving openly is creating a dilemma for military chaplains opposed to homosexuality. Some say they may leave the military if forced to choose between their faith and their service.